Transcending borders, bicycles have emerged as an essential transport option for citizens—and they play a significant role in making cities more sustainable. However, concerns about bike theft have held back both public bikeshare schemes and discouraged individual cyclists. 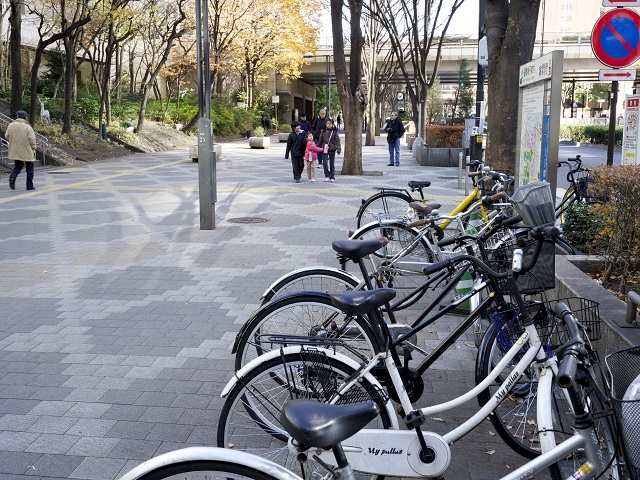 In Tokyo, Japan, the Eco-Cycle Anti-Seismic Underground Bicycle Park, a highly automated storing system, gained a lot of attention last year. In short, Eco-Cycle built an underground bicycle lot that has the capacity to hold around 800 bicycles. The impressive part is that it’s virtually 100 percent automated; users simply walk their bikes to the storage entrances, swipe their cards, and the machinery does the rest. The bikes are taken underground, sorted and stored in a cylindrical shaft until withdrawn later. This new bicycle parking garage not only saves a lot of space for dense Tokyo, but also provides a safe parking option for cyclists. In many cities within China, designated parking lots for bicycles can be easily found. For a small price, cyclists can pay to have their bicycles guarded for a limited duration of time while they take off on foot. This option is particularly useful for cyclists who are renting bikes and are making frequent trips around the city. However, while useful for cyclists, these lots often consume public space, like sidewalks and roads. With over-crowding and a graveyard of abandoned bikes, some bicycle lots can inconvenience pedestrians. Rather than focusing on the location of bike storage, a simpler way to boost security is through upgraded bicycle locks. Most cyclists use traditional U-locks, which offer some safety, but can be sprung relatively easily with the right tools. However, one new bicycle lock, called Skylock, has decided to merge technology with locking mechanisms for added security. To improve strength, the inventers added an additional bolt to the lock (U-locks typically feature one bolt), and integrates a “smart” monitoring system that alerts owners when the bicycle is being tampered with. This technology does consume electricity, but the lock runs on a rechargeable battery powered by a small solar panel. These advancements in bicycle security reflect an increased prioritization by cities to promote cycling as a sustainable transport mode. Indeed, an increasing number of cities have made or are currently developing policies to encourage people to cycle, like the Bicycle Master Plan for 2030 in Portland. Moreover, a record number of cities have launched bike share systems, allowing citizens to rent and use public bicycles. It’s important to note that cycling programs are not limited to developed countries, but are also becoming prevalent in developing countries. In fact, of the 20 biggest bikeshare programs on the planet, four are in China. But why is cycling so important? While the health and communal benefits of cycling are well documented, bicycles will perhaps be most critical in the global shift away from private vehicles. According to research by UNEP, around three-fifths of global vehicle growth is expected to take place in developing countries. While this poses a great challenge for developing cities, these areas also have the greatest potential to shift towards sustainable mobility by promoting cycling. In the future, implementing more bike facilities and crafting more bike-friendly policies, like bike lanes and bike share systems, can accelerate this process. However, one issue that shouldn’t be overlooked by urban planners is the security of bicycles themselves.